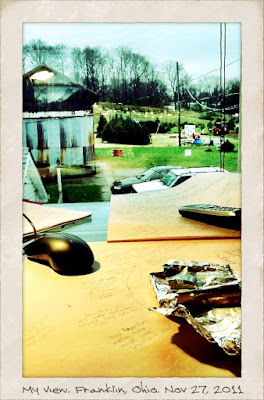 Kirsty Wertz (nee Reid): Day 223 of 365: it's raining Christmas trees! Day 223 of 365: it's raining Christmas trees! Dreary day outside for the guys helping families with their tree choices. Meanwhile, it's warm and cosy upstairs at the farm with my homework, coffee and an evil chocolate snack.